For companies working to build a strong presence on Facebook, it can start to feel like an overwhelming numbers game. 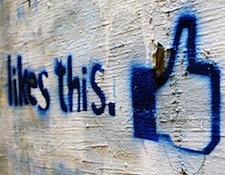 How do you get that ever-elusive number of Likes to steadily increase? The good news is that you can learn some valuable lessons about how to build up that fan following from studying the Facebook Pages of successful brands. 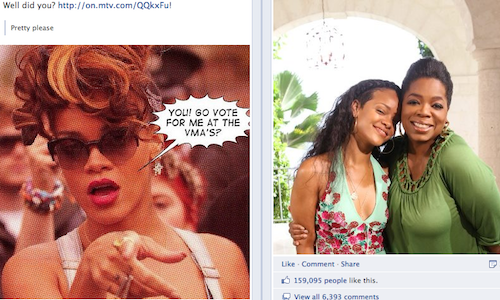 Two of the most successful brand Pages on Facebook are those for beverage company Coca-Cola and pop singer Rihanna. Both have many millions of fans thanks to smart social media marketing decisions that could be applied to a business of any size or industry. Here’s a look at some of the actions these two Pages have taken to cultivate such large and powerful fan bases on Facebook. Earlier this month, Coca-Cola was the first retail brand to exceed 50 million Facebook fans, so the company is clearly making some effective decisions on the network. 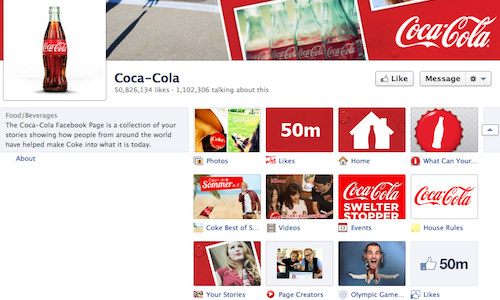 One of the elements that distinguishes Coke’s strategy is that the Facebook Page very clearly serves as a fan site. The focus isn’t on selling a product, but on leveraging brand reputation to create a community. It’s about strengthening the loyalty of existing fans as much as attracting new ones. A key motto for the soft drink company’s approach to achieving that community is “Your Stories.” This idea is written into its “About” section, and is the name of one of its internal apps. Fans of the brand can submit their photos involving Coke, and the best ones are selected for use in the company’s collage-style cover photo. This informal contest to appear on the cover photo can help get fans more excited about the company — and gets them thinking about the product in new ways. Coca-Cola’s method relies heavily on these internal apps for use within Facebook. They not only get fans involved with the brand, but they do so while encouraging them to embark on creative projects involving the product. The “What Can Your Can Become?” app has a call for fans to submit their own dance videos. And in honor of breaking the 50 million fan benchmark, the brand launched an app called “Likes” that’s aimed at crowdsourcing ideas for making the world better. The company will provide some funding for one of the innovations or causes, with the end result to be unveiled sometime in 2013. These apps are a way to get participation levels up on the channel, since you have to Like the app to participate, at the same time as you’re creating interest in a cool lifestyle and culture. Pop singer Rihanna is one of the most successful social media presences, both in the music industry and at large, with more than 60 million Likes on Facebook. Her community management team has done excellent work in creating a buzz around Rihanna as a person and a brand. Part of her success has come from playing to her strengths. Facebook, especially with the switch to Timeline, rewards good use of images and videos. It’s almost too easy for the attractive young singer to get attention by sharing her official photo shoots or her personal, behind-the-scenes Instagram snaps. Coupled with well-produced music videos, Rihanna’s Page is saturated with the eye candy that fans want. You don’t need to be a hot music star to succeed with the visual element of Facebook, but don’t underestimate the importance of looking good. Making an investment in great, eye-catching photos that will generate lots of Likes, comments, and shares among your fans can help your brand name get the viral word-of-mouth that’s so key to Facebook success. Another part of Rihanna’s strategy is the conscious development of a serious fan base. Her Page gets blitzed with official posts ahead of any event in order to build buzz. It’s an approach to use with caution, because you’ll need to walk the fine line between generating excitement and appearing repetitive. Rihanna’s team accomplishes this by starting far in advance and spacing out the posts. For instance, the first post about the singer’s interview with Oprah Winfrey came nearly two weeks before the episode aired on television. In the week before the interview was televised, her team posted about it every day, frequently accompanied by a photo or video clip. Her Page also regularly acknowledges and encourages the dedication of her fans. Many milestones, whether in record sales or music video views, are shared with her Facebook base with a thank-you. Rihanna and her team is well aware of how important it is to make the singer’s followers feel involved and invested in her success. That’s a good approach for any brand to take. Know any other successful brands that are rockin’ it with millions of fans? Let us know in the comments.